It's New Year's Day (happy new year!) so hangover soup is the order of the day. My hangover is of the prosecco-red wine-beer variety. Cringe. 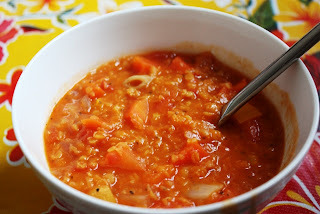 This soup is vegan, chunky, and full of red and orangey goodness. And it will bring you back if you are too far gone. I feel half human after a hot shower and a bowl of this. Serve on its own or with your favourite bread. Num num. But I used the comment section on their website and their facebook pages. I believe we have to start demanding our needs be met as we are a significant part of their viewers. Everyone reading this should demand vegan shows get equal air time. You blog owners should ask your readers to write these networks and ask for vegan shows. I write to ask you to become fair and balanced in the type of food shows you present to the public. You must realize that there are millions of people interested in healthy eating and that means vegan eating. Do we have to organize a boycott to get vegan cooking and baking shows on your network? The endless parade of meat and dairy promotion usually by overweight, unhealthy looking hosts is not appetizing. I change the channel so often when your gluttonous shows come on. How to shove the most meat and cheese down your stomach. Sending people to far places to participate in cruelty eating also does not thrill me. I would like to see shows on growing your own fruits and vegetables in every zone and shows teaching vegan cooking. I would like to see vegan chefs competing with each other and cooking for celebrities. You may think that the only ads you can sell are to the meat and dairy industry but there is a whole world of people who will advertize on vegan sites. You need younger vegans on your marketing staff selling ads to the wholesalers like vita mix blenders, whole foods, bulk seed companies, tofu manufacturers, anti cruelty groups, etc. There are hundreds of vegan cooking blogs and at least half your shows should be teaching people to cook in new more healthy ways. There are grants available from the WICK and Food Stamp programs. Are you beginning to see the vast audience you are ignoring by your boring traditional shows loaded with dairy and meat. Nothing new – same old stuff over and over. And you could do so much more for the health of your viewers.